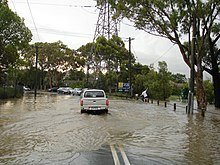 Flash floods can occur under several types of conditions. Flash flooding occurs when it rains rapidly on saturated soil or dry soil that has poor absorption ability. The runoff collects in gullies and streams and, as they join to form larger volumes, often forms a fast flowing front of water and debris. Flash floods most often occur in normally dry areas that have recently received precipitation, but they may be seen anywhere downstream from the source of the precipitation, even many miles from the source. In areas on or near volcanoes, flash floods have also occurred after eruptions, when glaciers have been melted by the intense heat. Flash floods are known to occur in the highest mountain ranges of the United States and are also common in the arid plains of the Southwestern United States. Flash flooding can also be caused by extensive rainfall released by hurricanes and other tropical storms, as well as the sudden thawing effect of ice dams. Human activities can also cause flash floods to occur. When dams fail, a large quantity of water can be released and destroy everything in its path. The United States National Weather Service gives the advice "Turn Around, Don't Drown" for flash floods; that is, it recommends that people get out of the area of a flash flood, rather than trying to cross it. 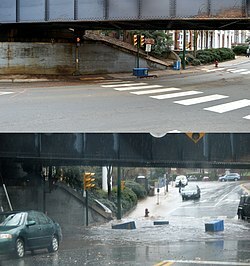 Many people tend to underestimate the dangers of flash floods. What makes flash floods most dangerous is their sudden nature and fast-moving water. A vehicle provides little to no protection against being swept away; it may make people overconfident and less likely to avoid the flash flood. More than half of the fatalities attributed to flash floods are people swept away in vehicles when trying to cross flooded intersections. As little as 2 feet (0.61 m) of water is enough to carry away most SUV-sized vehicles. The U.S. National Weather Service reported in 2005 that, using a national 30-year average, more people die yearly in floods, 127 on average, than by lightning (73), tornadoes (65), or hurricanes (16). In deserts, flash floods can be particularly deadly for several reasons. First, storms in arid regions are infrequent, but they can deliver an enormous amount of water in a very short time. Second, these rains often fall on poorly absorbent and often clay-like soil, which greatly increases the amount of runoff that rivers and other water channels have to handle. These regions tend not to have the infrastructure that wetter regions have to divert water from structures and roads, such as storm drains, culverts, and retention basins, either because of sparse population or poverty, or because residents believe the risk of flash floods is not high enough to justify the expense. In fact, in some areas, desert roads frequently cross a dry river and creek beds without bridges. From the driver's perspective, there may be clear weather, when a river unexpectedly forms ahead of or around the vehicle in a matter of seconds. Finally, the lack of regular rain to clear water channels may cause flash floods in deserts to be headed by large amounts of debris, such as rocks, branches, and logs. Deep slot canyons can be especially dangerous to hikers as they may be flooded by a storm that occurs on a mesa miles away. The flood sweeps through the canyon; the canyon makes it difficult to climb up and out of the way to avoid the flood. 2007: Sudan floods, 64 dead. 2009: September 26 in Metro Manila primarily Marikina city, Taguig City, and Pasig City; and many municipalities of the provinces of Rizal, Bulacan and Laguna leaving more than 100 dead and thousands homeless. It also submerged several municipalities under feet of deep water for several weeks. 2009: October 1, Giampilieri, Messina, 37 dead. See also 2009 Messina floods and mudslides. 2011: Lockyer Valley, Queensland, Australia. 21 dead, mainly in the town of Grantham. 2012: May 5, Nearly three weeks of damming left 72 dead in the Seti Gorge in Upper Seti Basin. Rock and avalanche fall from the western part of Annapurna IV mountain in Pokhara, Nepal. 2012: Krasnodarskiy Kray, Russia. 172 dead following a flash flood that struck at 2 A.M. local time on 7 July. Main cities that were hit are Krymsk and Gelendzhik. 2014: Srinagar, Jammu & Kashmir, India: approximately 300 dead. 2016: August 13, South Louisiana floods: 13 dead. ^ "Flash Flooding Definition". National Weather Service. Retrieved August 31, 2017. ^ WeatherEye (2007). "Flash Flood!". Sinclair Acquisition IV, Inc. Archived from the original on 2009-02-27. Retrieved 2009-09-09. ^ a b National Weather Service Forecast Office Morristown, Tennessee (2006-03-07). "Definitions of flood and flash flood". National Weather Service Southern Region Headquarters. Retrieved 2009-09-09. ^ "Watches, Warnings & Advisories—Flash Flood Warning". National Weather Service. Archived from the original on 2008-01-11. Retrieved 2007-06-25. ^ "A Preparedness Guide to flash floods #1 weather-related killer in the United States". U.S. Department of Commerce, National Oceanic and Atmospheric Administration National Weather Service, Federal Emergency Management Agency, American Red Cross. July 1992. Retrieved 2007-06-25. ^ "Turn Around Don't Drown". Retrieved 2007-06-25. ^ McGuire, Thomas (2004). "Weather Hazards and the Changing Atmosphere" (PDF). Earth Science: The Physical Setting. Amsco School Pubns Inc. p. 571. ISBN 0-87720-196-X. Archived from the original (PDF) on 2008-06-25. Retrieved 2008-07-17. ^ "Making Sense of Nepal's Seti River Disaster". earthobservatory.nasa.gov. 24 January 2014. ^ "At least 105 dead as torrential rains inundate southern Russia". Los Angeles Times. 2012-07-07. Retrieved 2012-07-07. ^ Kuzmin, Andrey (2012-07-08). "Russia's Putin demands answers after floods leave 150 dead". msnbc.com. Reuters. Retrieved 2012-07-08. ^ "Uttarakhand: More than 5000 dead; 2000 still stranded". Business Standard. 2013-06-28. Retrieved 2013-06-28. ^ Jane, Sophie (2014-09-07). "Hundreds killed by landslides and flash floods triggered by heavy monsoon rains in Kashmir". Dailymail.co.uk. Retrieved 2014-12-04. ^ report, Advocate staff. "What caused the historic August 2016 flood, and what are the odds it could happen again?". The Advocate. Retrieved 2018-01-27. ^ "9 YOUTH DEAD IN SOUTHERN ISRAEL FLASH FLOODS". Retrieved 2018-04-26. ^ ecodellojonio.it (ed.). "Tragedia raganello: allerta gialla ignorata, tragedia evitabile" (in Italian). Retrieved 2018-08-21. ^ bbc.com (ed.). "Search for missing after 15 killed in Europe floods". Retrieved 2018-10-12. ^ "Wikipedia" (in French). Retrieved 2019-01-22. ^ "Floodwaters deluge Iran, killing at least 23, after a month's worth of rain turns roads into rivers". ^ "Afghanistan Flooding Kills at Least 16, Official Says". AP via The Weather Channel. Retrieved 2019-03-29. Schmittner, Karl-Erich; Pierre Giresse (August 1996). "Modelling and application of the geomorphic and environmental controls on flash flood flow". Geomorphology. 16 (4): 337–47. Bibcode:1996Geomo..16..337S. doi:10.1016/0169-555X(96)00002-5. Wikimedia Commons has media related to Flash floods. Wikivoyage has a travel guide for Flash floods.